Letter stencils are useful for many things like school projects to personalizing a wall. They come in handy for craft projects like scrapbooking. 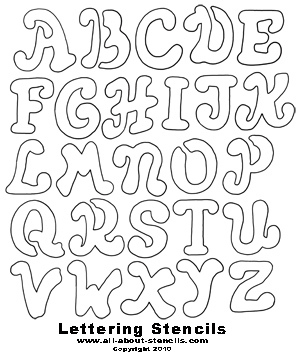 Let's start out with some alphabet stencils from Stenciling Letters. They are free, printable and ready to go. Just print, cut out the openings and apply. But don't just print and leave - read on for some interesting and useful hints and tips. Printable stencils are great for many reasons. One is that you can resize them to fit your project area. Take the print to a copy machine and enlarge or reduce. But maybe your printer gives you options for percentage size to print. Check for that option when your print dialog box appears. If you need your stencils to be huge (for example you want to paint your name on a wall) then take it to a document printer shop and they can get it as large as you want. Before you cut out the openings of the stencil cover it with a clear protective coating like clear shelf liner so that you can use it again and again. For some fun and funky printing check out the Graffiti Fonts page. 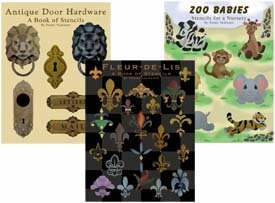 These are all part of our extensive Free Stencils Collection. Have you ever considered creating Oriental Art? Well, with some Chinese Letters and a few stencils you'd be surprised at the beautiful art you can paint. Hey! Don’t forget that I (and everyone else) want to see what you have done with your letter stencils. Just click on Stenciling Projects to get your masterpiece showcased here on this web site. Won’t that be exciting! Or if you have any questions or want to share information join in on the Stencil Blog. Well, I hope to hear from you soon. Instant gratification at its finest! You don't need a special printer - these designs are specially formatted to print from your home computer on standard letter sized paper. Once downloaded, you will have your complete stencil booklet with patterns and instructions. Just click, buy and print! Return to Home Page from Letter Stencils. Return to Stencil Designs from Letter Stencils.